If you're thinking about putting your home on the market, making few cosmetic upgrades will probably help it sell quicker and for more money. A fresh coat of paint, some new carpet and tidy landscaping go a long way to help you get the most money for your home. But have you considered how the appearance of your garage might help -- or hurt -- your home selling prospects? Often overlooked by many sellers, a neat, tidy and organized garage will speak to buyers' desires for usable work and storage space. So how can you make the most of your garage to increase your home's value? Here are some tips to help you create a garage space that helps you realize a tidy profit on your home. If your garage is cluttered and messy, buyers won't be able to envision how they'll use the space. They won't be able to see how great your garage truly is because of all your "stuff." Your first step should be to eliminate any unnecessary clutter. Here are some tips to help you get started. The ceiling often gets overlooked as a potential storage area in your home. Overhead shelving will allow you to stow away off-season items or things you don't use often. Put beach chairs and coolers up high in the winter and replace them with snow shovels and holiday decorations in the summer. Home buyers will appreciate the convenience the overhead storage shelves offer and possibly be willing to pay more for your house. An epoxy floor coating will not only make your garage floor look great, but it's practical too. The highly durable resin repels stains, provides a non-slip walking surface and protects the under floor from dings, cracks or other physical damage. Epoxy floor coating is available in a variety of attractive colors and styles that will make your garage look great for potential buyers who want a stylish new home. 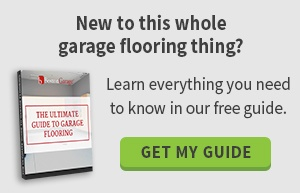 Coatings that look like granite or terrazzo will give your garage floors a luxurious feel. It's easy for walls to get scuffed and dinged in the garage so add a new coat of paint. That way, the walls will look as good a your epoxy floors and buyers can appreciate the well-kept appearance of your garage. Be certain to color coordinate the walls and floor and chose shades that compliment your custom cabinetry. If you're looking to sell your home, it's probably best to go with a neutral color scheme. Tans and grays are always excellent options. Increase storage space by adding a loft. in your garage. A loft is essentially a wooden platform that's either suspended from the ceiling or supported by wooden beams. It should be high enough so you have room to park your vehicles and work, but large enough to give you ample space to store your stuff. You'll also need stairs or a ladder to reach the loft. For many homeowners, this can be an easy weekend DIY project. 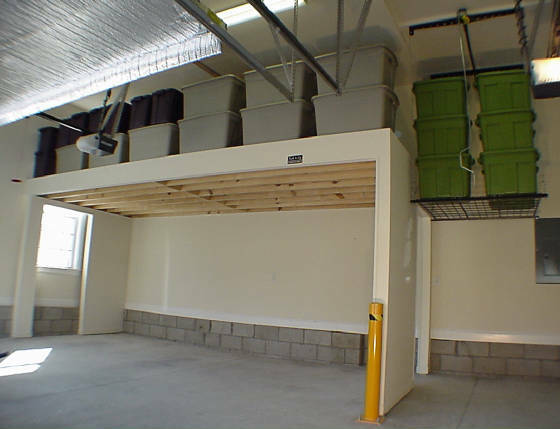 Here's picture of a storage loft with overhead shelving. Many garages feature fluorescent lighting that's cold, harsh and may or may not give you enough light to work. Try try task lighting over a workbench and consider larger LED light strips for the ceiling. These changes will improve the ambiance in your garage and make it more user friendly. Potential buyers will find the improved garage lighting a step above other homes that have old-school fluorescent lights. Tip 7: Put tools within easy reach. Hang a wire grid or set of hooks where homeowners can hang their tools and gear. It's nice to have tools at arm's reach when your working on a project. Potential home buyers will like the convenience offered by a peg board with hooks or wire grid where they can hang their equipment. Buyers will like not having to install these items themselves once they move in. 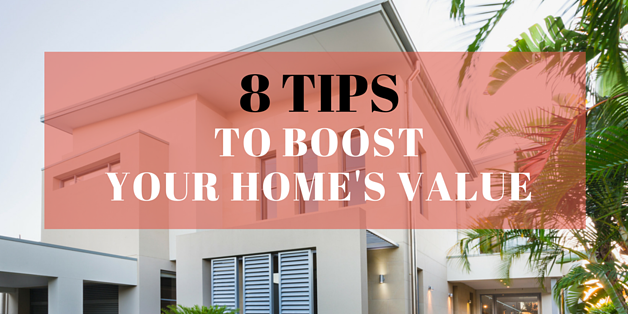 Tip 8: Evaluate the garage doors. Check to make certain your garage doors are operating properly. If you have a garage door opener, be sure it works as intended. Perhaps more importantly is the view of the garage doors from the exterior since this is what potential buyers will see from the curb. If there are cracks or dings in the doors, repair them. If they need paint, add a coat, and if the doors are in really bad shape, consider installing new doors. You might also make visual improvements to the exterior of your garage doors. For example, adding decorative hardware is an easy way to make your home look more valuable by improving the curb appeal. When you're preparing to sell your home, don't forget about the garage. Potential buyers look for amenities like garage storage and organization. But if you take things a step farther and install improved lighting, epoxy floor coating and spiff up the garage doors, some buyers will actually be willing to spend more on your home. If we can help get your home ready to put on the market, give us a call today at 781-836-5145.